Last time we saw the swashbucklers they had enlisted the help of Captain Barbossa (Geoffrey Rush) and Tia Dalma to bring Captain Jack Sparrow (Johnny Depp) back from Davy Jones’ locker. To do this Barbossa has to navigate the crew to the end of the world. Will Turner (Orlando Bloom) still believes that Elizabeth Swan (Keira Knightley) is in love with Jack and the tension between the two builds throughout the movie. Will must choose between Elizabeth and his Father, Bootstrap Bill, who is enslaved by Davy Jones. Sticking true to the pirate way of life the script has each of the main characters working together, but only doing so to reach their individual goal. There is backstabbing and plot twists galore, which is a credit to the writers. 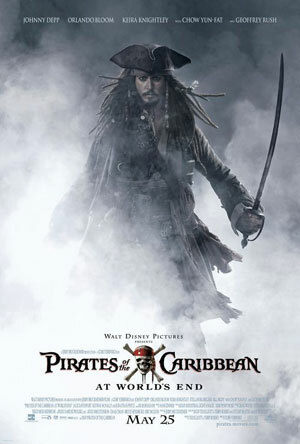 This could have been a very linear movie to write, save Jack – defeat Davy Jones – escape from Cutler Beckett and the army – marry Elizabeth Swan and Will Turner – The End. As it turns out you don’t know what will really happen until it has happened. I also give credit to the writers for keeping this movie from getting too campy. I felt the second movie rehashed the same jokes as the Curse of the Black Perl and made Captain Jack look more like a clown then a pirate. There was humour in this movie at the right times, but didn’t cross the line of being goofy. I found the special effects to be a little more impressive then the other two movies. The battle scenes on the boats seemed to be sharper. Cannonballs, splinters, flames and smoke filled the screen in great detail. The one thing I didn’t think worked was multiple Jack’s. It just seemed too abstract and obscure. Just a guess, but I think it was about more face time for Depp then anything else. The movie is so involved with all the characters that I think the director wanted to remind everyone that Johnny Depp is the star of this movie. I made the assumption going into this movie that this would be the last of the trilogy, but once again we find it open ended allowing the Priates franchise to continue. Whether it’s with the same characters or the same actors who knows, but if they keep up this quality I will certainly continue to watch them.